The non-surgical healthy skin duo. 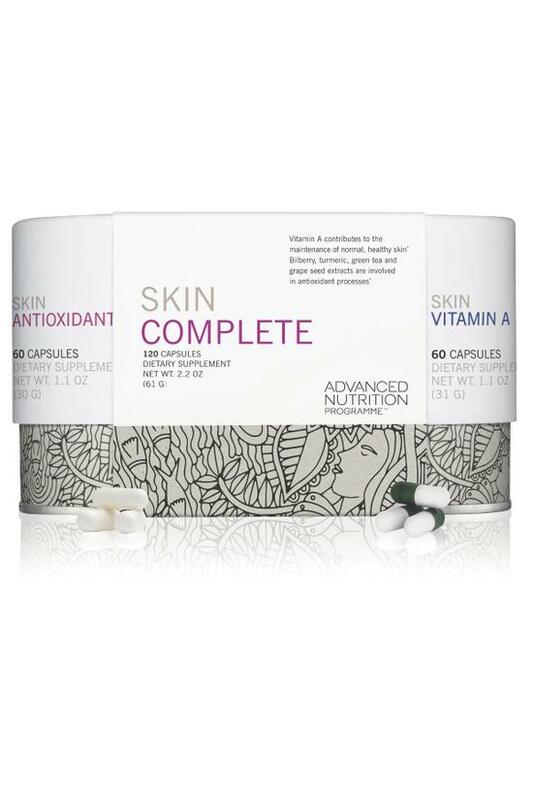 Skin Complete is the first step in any good skincare regimen. Suitable for all skin types, this duo pack is a combination of two premium supplements that promote healthy skin: Skin Vitamin A and Skin Antioxidant. They are available as a pack together, or separately. Skin Antioxidant - A skincare supplement suggested for all skin types. Skin Antioxidant is formulated with seven super antioxidant phytonutrients found in plants. The skin is bombarded with damaging free radicals day and night; everything from airborne toxins to any source of light, including your computer screen. Antioxidants help to protect and repair the skin, which keeps it looking younger for longer. * The phytonutrients in Skin Antioxidant are especially effective since they are enhanced with beta-carotene, a form of vitamin A. One capsule daily with food is recommended. Skin Vitamin A - A skincare supplement suggested for all skin types. Skin Vitamin A contains vitamin A enriched with vitamin D. Vitamin A is important to cell production and growth. It also stimulates the cells responsible for the skin's firm and healthy tissue and so is known as the anti-aging vitamin. * Vitamin D optimizes the skin's immune system and helps to destroy free radicals that can cause premature aging. * By supplementing with Skin Vitamin A, you will help nourish your skin from the inside. Each capsule contains optimum levels in an easily absorbable form. One capsule a day with food is recommended. Improves the appearance of the quality of the skin and gives antioxidant protection. One capsule of Skin Vitamin A and one capsule of Skin Antioxidant daily with a meal is recommended. Skin Antioxidant is vegan and wheat-free. Skin Vitamin A is wheat-free. Not suitable for vegans.